I've joined a knitting group! Finally! 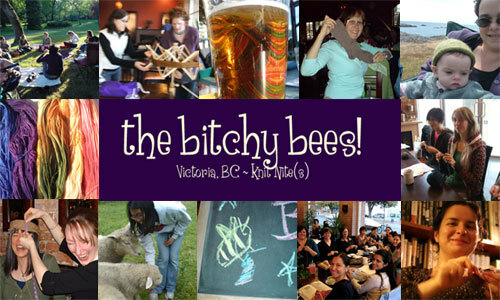 I discovered The Bitchy Bees last month and that they meet up twice a week at a coffee shop nearby. I'm a wee bit mad at myself cause my last place was a few blocks away from Khona Cafe and I used to go there all the time to drink tea and peruse the free Wi-Fi. I didn't see any advertisement for the group though. But still, I could've joined a year ago!! Yes, after living in Victoria for a little over a year now, I've finally took the initiative to go out and join something in an attempt to make some friends. Is it just me, or is it really hard to make friends? When I had first moved to Vancouver I had school and work to help me out in the friends department. When I moved here I thought maybe work would pave the way to some friendships, but then I found out that all the people I worked with were fresh out of high school and I felt way too old and couldn't relate to any of my co-workers. So I still remain friendless. Hmm..maybe if I wasn't so socially awkward, making friends might be easier. Anyways, back to the knit nights. I've only gone to a few of the Friday night meet ups, as Brett's schedule is never stable enough for me to go every single week. Although, with spring and summer around the corner, his students will be out of school and his schedule will change and I'll be able to make it every week. Yay! "Twice a week we invade the serenity of Khona Cafe and wreak havoc and knitting mayhem upon its staff and customers. We love knitting almost as much as we love being obnoxious! Come sit, stitch, socialize and swap stories and ideas with us. It’s as simple as that, nothing pretentious at all. We are a boisterous and passionate group of knitters, and despite the name, we’re really nice :-P –Women and men, beginners and experts, bohemians and professionals, young and old, knitters, crocheters and other textile crafters – all are welcome! I had fun when I went and the ladies are uber nice and lovely. And the best part? I'm without the baby for a few hours and can enjoy a cup of coffee without it getting cold cause I'm too busy changing nappies, burping, or entertaining the little one! I can't wait for next week's meet up!